Last updated by Marcia Mayne at June 26, 2014 . 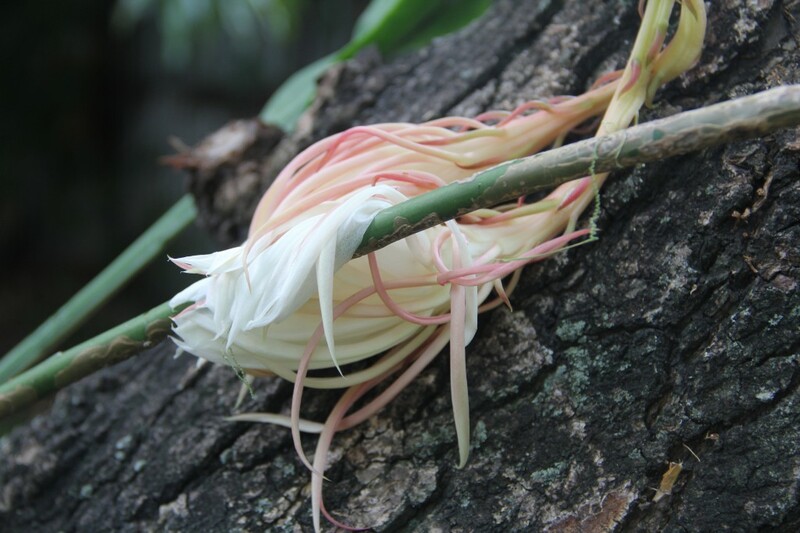 I thought it quite an achievement when I caught the once yearly flowering of the night-blooming cereus last year. I had experienced a phenomenon many flower lovers would probably give a vital body part to see. Visiting a family friend over the weekend, I noticed several unopened buds on a cactus on the periphery of their property. How unusual, I thought to myself. You should get a photo. But I returned my attention to the people with whom I was speaking, people I hadn’t seen in a while. During a lull in the evening’s activities, I looked over and saw that flowers had replaced the buds I had seen earlier. I didn’t have my camera so I grabbed my phone and practically dragged my cousin, an award-winning flower lover, over to where the night-blooming cactus was. She had seen it too and told me after that she planned to ask our family friend for a cutting. The flowers looked similar to the cereus I had seen last year. It was surprising to me then I remembered that the cereus is from the flowering cactus family. Here’s a photo of the night-blooming cereus for comparison. 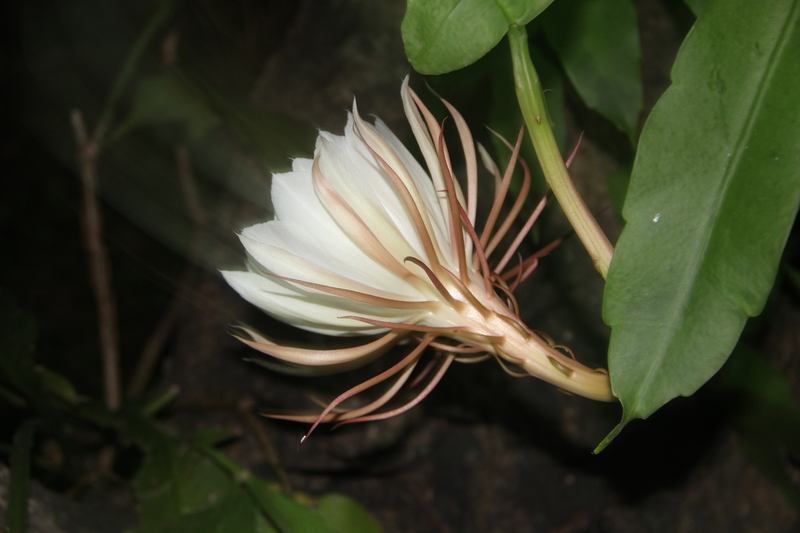 While the night-blooming cereus lasts only one night, this genus of the night-blooming cactus lasts two. Both attract a special moth that causes them to pollinate. As I write this I realize that one thing was different — the cactus didn’t have the subtle fragrance that accompanied the cereus. But it had rained, no poured, that evening so the rain could have washed away the scent. Have you seen a night-blooming cactus? This week, I’m linking this post to Budget Traveler’s Sandbox and Travel Photo Monday. Be sure to check out the other photos that are posted there. One of the best things about the tropics is the profusion of flowering plants. They spill out from gardens, line country roads and overhang private walkways, and paint my surroundings in vibrant red, yellow, purple, and white. If you make only one flower in your lifetime, like the Queen Achmea does, it would have to be your masterpiece. Don’t you agree that this is? 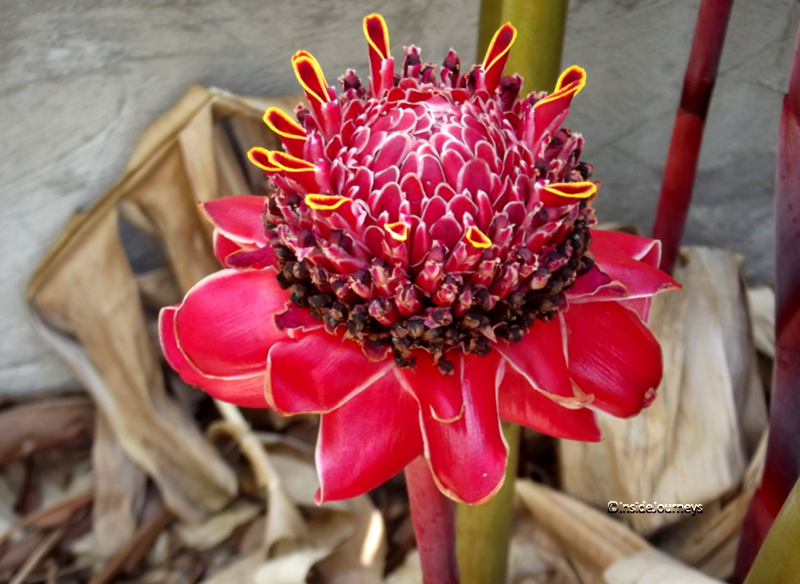 I discovered the Queen Achmea bromeliad at Ahh…Ras Natango earlier this year. Tamika, one of the owners, had posted a photo on their Facebook page. My eyes popped open when I saw it. I thought initially, that she had tied a pink ribbon on the plant. When I clicked the photo, I noticed that the ‘ribbon’ was part of the plant. I called Tamika right away and told her I wanted to see it. The beauty of this flower left me speechless. I stared at it for a long time… Although it can take a year, when the plant finally blooms, it lasts for up to two months. Note: Bromeliads include the pineapple. The color is what drew me to this torch ginger, which grows in the backyard at my stepmother’s. I was fortunate to see this slightly opened one and then later to get a photo of one that was fully opened. 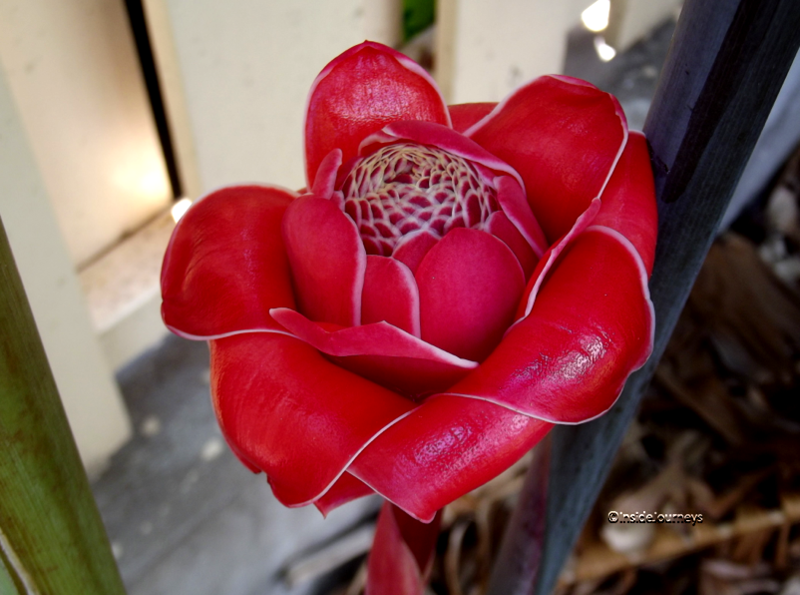 The torch ginger is known by several different names and also comes in pink. They are used in floral arrangements and, in south-east Asia, used in salads. The jade plant I’m used to is the one commonly called the money tree. It’s a succulent and has thick shiny leaves. They make great house or office plants. I had one for many years. This jade flower is used to make leis. Can you imagine the beautiful it makes? 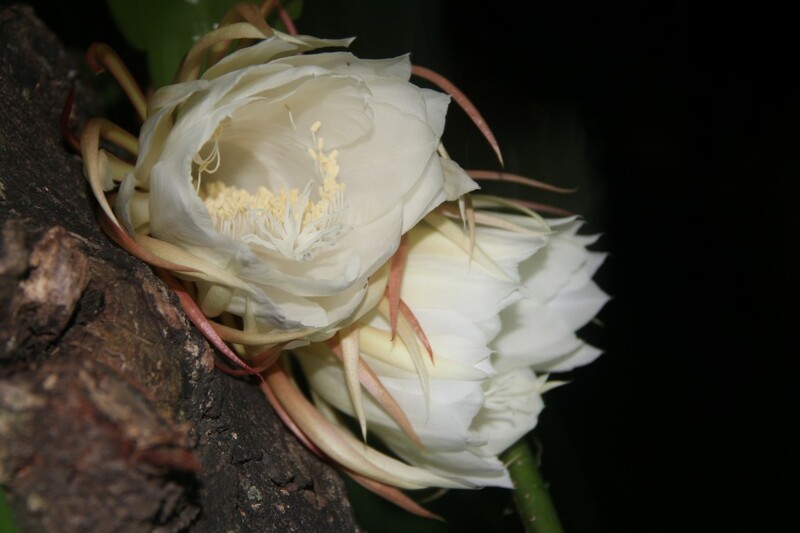 The night blooming cereus blooms once a year and only at night when it attracts a special moth which pollinates it. When that happens, the flower begins opening slowly around 10:00 p.m. While its blooming, it perfumes the air with a gentle fragrance. I took this photo around midnight on the night it bloomed. By dawn, it will be wilted. This is how it looked the next morning. This week, I’m linking to Travel Photo Monday. Be sure to check them out for more photos from around the world. I’ve been hearing about the night blooming cereus for at least three years now. 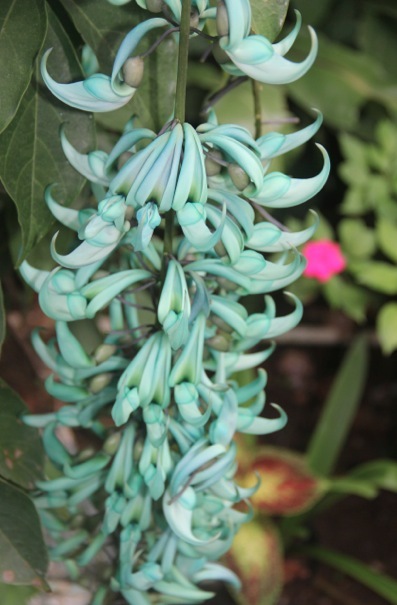 As the name suggests, this plant from the flowering cactus family, blooms only at night — and only once per year. I was lucky, this time, to be visiting family when their night blooming cereus bloomed on Friday night; luckier still because I had my camera, and it put out not one but four blooms. It’s a slow process, this unfolding of the petals, but a lot more fun than watching paint dry. The bud begins its leisurely awakening around 10 pm. But by morning, the flower has wilted. It will come alive again when the special moth it attracts pollinates it. There I was on Friday night, going out to the back yard every hour or so, camera at the ready, to see how open the flower was. And each time, I’d take a few photos. I wish I’d taken some before photos. Anyway, I did this about three times. Each time, the flower looked as if it was open just a bit more than the last. Even though they weren’t fully open, the fragrance from the night blooming cereus bathed the backyard in the most subtle perfume that I didn’t mind going again and again. I wish I could have bottled the scent. The waiting was the hardest. At around midnight, I started to feel tired and decided, reluctantly, to go to sleep. 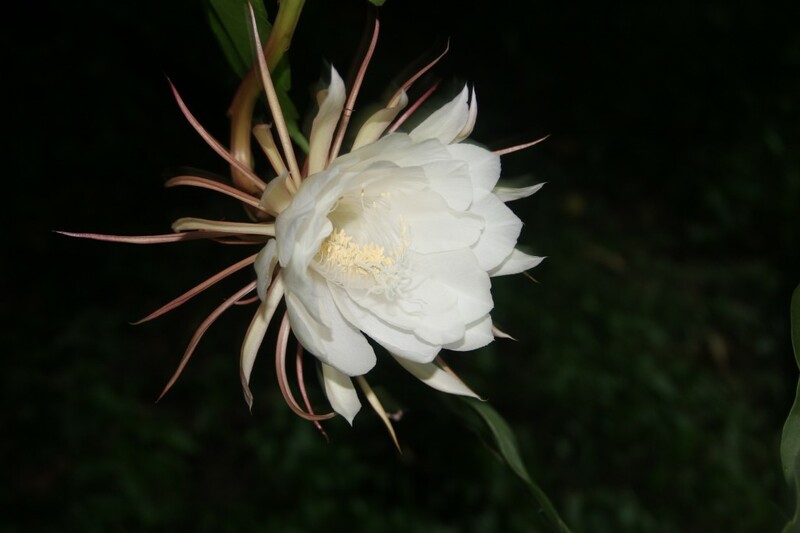 I was a bit disappointed not to be able to see the full flowering of the night blooming cereus but I was happy to have seen it at all, and happier still to be able to take these photos. By morning, the flower looked spent, like someone who’d been partying all night. Here’s a time lapse video I found on YouTube of the opening of the night blooming cereus. This week, I’m linking this post to Travel Photo Monday and Tablescraper. Be sure to check out the other photos that are posted there.